Chalcis (; Ancient Greek & Katharevousa: Χαλκίς, Chalkís) or Chalkida (Modern Greek: Χαλκίδα, [xalˈciða]) is the chief town of the island of Euboea in Greece, situated on the Euripus Strait at its narrowest point. The name is preserved from antiquity and is derived from the Greek χαλκός (copper, bronze), though there is no trace of any mines in the area. In the late Middle Ages, it was known as Negropont(e), an Italian name that has also been applied to the entire island of Euboea. Negroponte played a significant role in the history of Frankish Greece, and was attacked by the Principality of Achaea in the War of the Euboeote Succession (1257/8), the Catalan Company in 1317, the Turks in 1350/1, until it was finally captured by the Ottoman Empire after a long siege in 1470. That siege is the subject of the Rossini opera Maometto II. The Ottomans made it the seat of the Admiral of the Archipelago (the Aegean Islands). In 1688, it was successfully held by the Ottomans against a strong Venetian attack. The modern town received an impetus in its export trade from the establishment of railway connection with Athens and its port Piraeus in 1904. In the early 20th century it was composed of two parts—the old walled town at the bridge over the Euripus, where a number of Turkish families continued to live until the late 19th century, and a sizeable Jewish community lived until World War II, and the more modern suburb that lies outside it, chiefly occupied by Greeks. 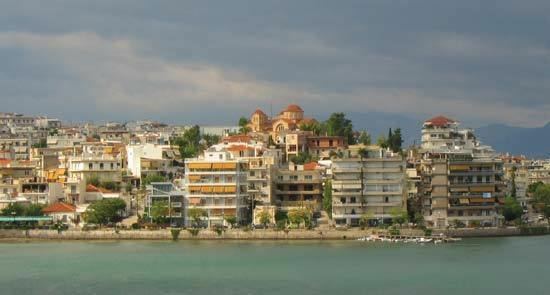 The Byzantine diocese of Chalkis was initially a suffragan of the Archdiocese of Corinth, but in the IXth century was transferred to the Metropolitan of Athens, remaining in the sway of the Patriarchate of Constantinople. It was also known as Euripo, like it's mentioned in the Byzantine imperial Notitia Episcopatuum since emperor Leo VI the Wise (886-912).